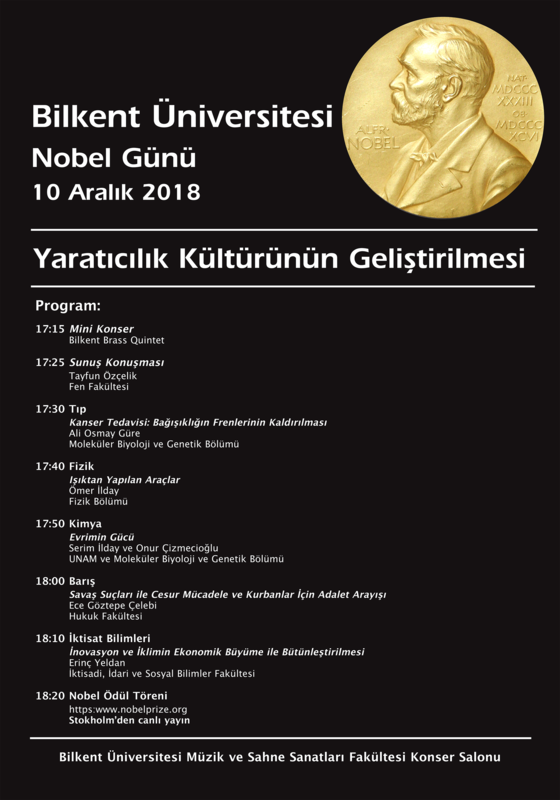 On December 10, Bilkent University will celebrate the awarding of the 2018 Nobel Prizes with a symposium and a live transmission of the award ceremony. The Nobel Day Symposium, on the topic of “Enhancement of Cultures of Creativity,” will take place at the Bilkent Concert Hall at 5:15 p.m. Academicians and researchers from UNAM and the Faculties of Science, Law and Economics, Administrative, and Social Sciences will offer remarks providing insight into the achievements being honored by the 2018 Nobel Prizes in Medicine, Physics, Chemistry and Economics, as well as the Peace Prize. A live transmission of the Nobel Prize award ceremony from the Stockholm Concert Hall will follow. For those unable to attend the Nobel Day event at the Bilkent Concert Hall, the ceremony will also be streamed live.